Matt Parker is one of those natural geniuses. He runs a website development company. He shapes custom boards for his own brand, Album Surfboards. He was the first dawn patroller to break out the electric scooter. Here is his latest genius —- the surf shower. To many, it may look like a simple plastic water bottle. In fact, that is exactly what it is. And, it is recyclable. He stuffs it in his pack and gets a thousand uses out of it. 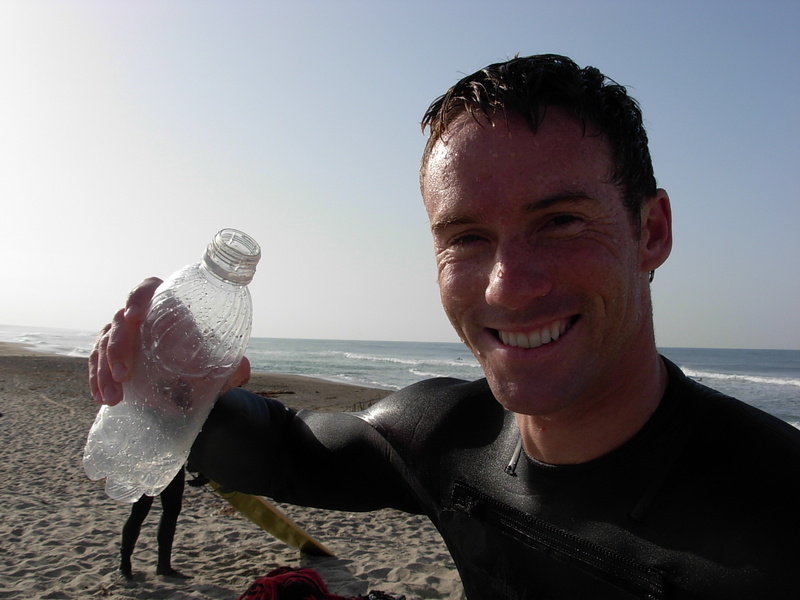 After a couple hours of shredding the waves, he fills up the bottle with saltwater and uses it to rinse off his feet and wetsuit. Seems simple. That’s the beauty of it. An organic invention from home. No expensive trips to REI. No waiting for FEDEX for a PAYPAL-infused delivery from western North Dakota. You just pull it out of the recycle bin. Genius, pure genius. Maybe we could put a surf sticker on it and sell it for $20. I guess we’ll be seeing more of these. A high-class shower without getting soaked. You can catch Matt at http://www.albumsurf.com/ or on Facebook at http://www.facebook.com/pages/San-Clemente-CA/Album-Surfboards/97499185852. Some may think that is a big word for surfers. But, Trestles surfers probably understand this topic better than most people. That’s because we surf everyday in a physics laboratory where this concept is at work. Hydrogeomorphology is the study of how land forms are changed by the flow of water over, under, and through them. San Mateo Creek, as one of the last pristine watersheds in Southern California, wends its way through the hills and coastal plains, carrying those same landforms with it to the ocean. In this post, let’s look at San Mateo’s hydrogeomorphology at a macro scale. In coming days, we will drill down to a more micro level. 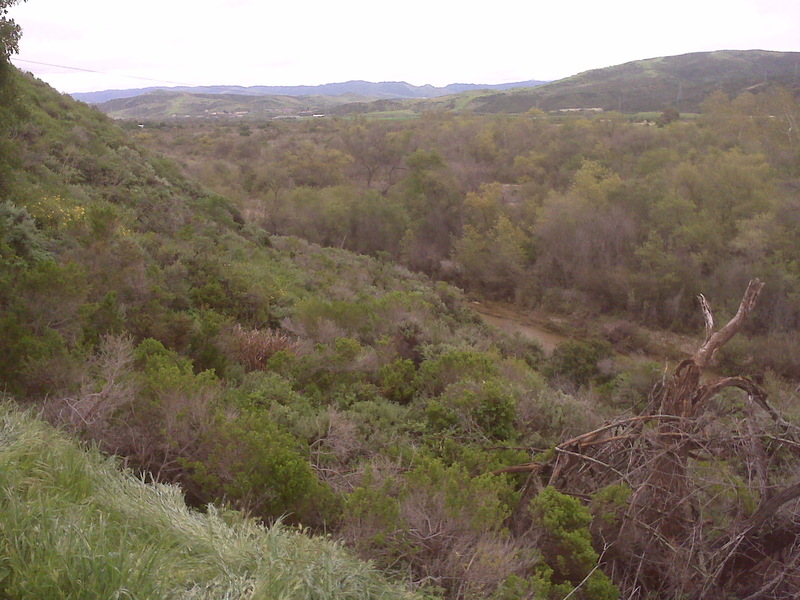 At the macro scale, San Mateo Creek “braids” its way through Camp Pendleton. In wet years, the alignment of the creek bed changes from one side of the flood plain to the other as it meets the resistance of downstream boulders, logs, and vegetation. Some years it hugs the cliff near Cristianitos. The next year it may flop over the south bank, eating away at the old tomato fields further into the base. 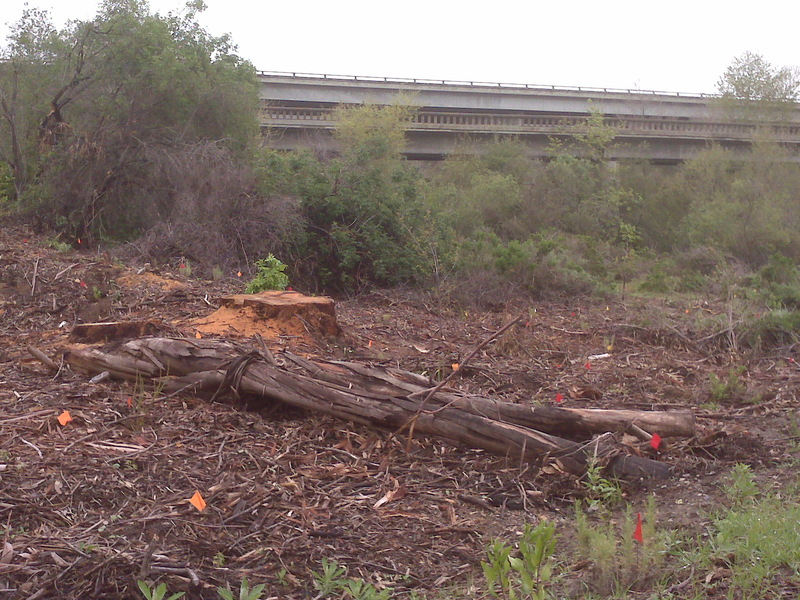 If the area is ever developed (like with a tollroad) and the creek is channelized, the beauty of the floodplain will be reduced to a thin ribbon instead of a rich habitat-covered canvas. And, the natural processes will be adulterated. Further downstream, where the creek meets the ocean, an estuary is formed. While there is some variation in definitions, an estuary is where fresh water meets ocean water. In that zone, the biological resources are rich. Have you ever noticed how the flocks of seagulls and terns sit on the rocks where the creek flows onto the beach? They are looking for that free meal. Estuaries generally have a free exchange of salt and fresh water, especially when the tides surge water back and forth. That can happen when the creek has broken through the berm and flows freely. That is what has been going on for the last two months. 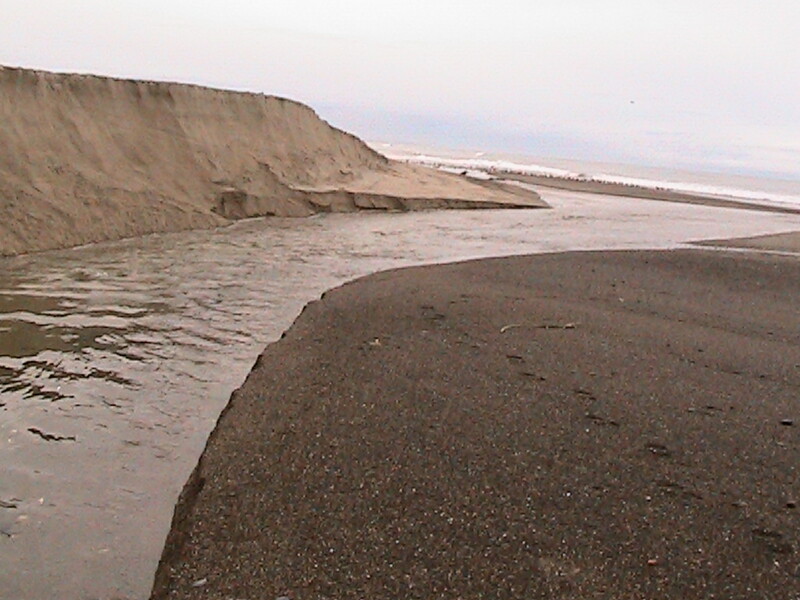 On Tuesday, the creek stopped flowing to the ocean, at least on the surface. 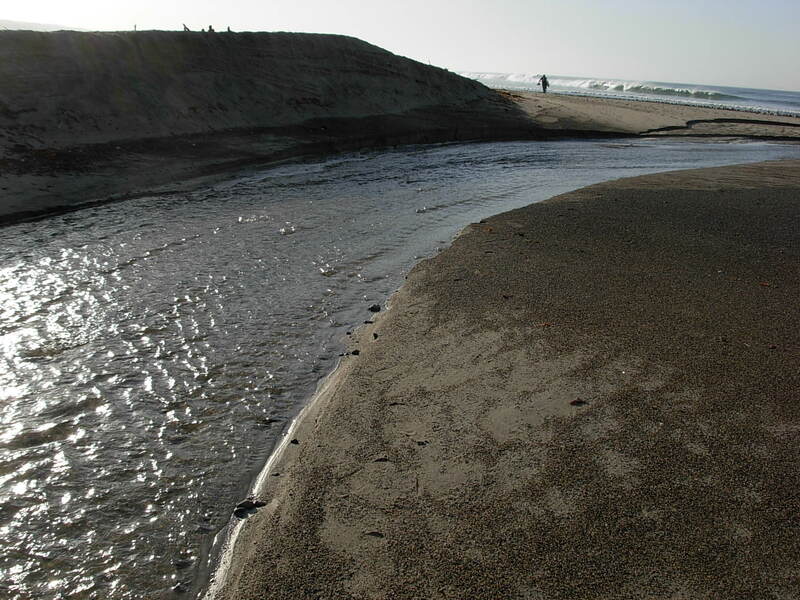 The only creek water making it to the sea will flow underground through the sand berm. So, before our very eyes the mouth of San Mateo Creek will transform from a tidal wetland/estuary into a natural lagoon. The emergent marsh vegetation (cattails and bulrush) will return around the perimeter and eventually surround the lagoon, blocking it from view, until the next El Nino storms blow out the berm. As you watch geomorphology in action in the coming months, keep an eye on the flora and fauna as well. Have the steelhead safely made it upstream through the lagoon to their spawning grounds? Have waters stilled enough to allow the turtles to poke their heads above the mirror-like water surface? Oh, and will the beavers start building new lodges for their families? In future posts, we’ll move on to how other hydrogeomorphologic forces work in our own backyard. Rock on! 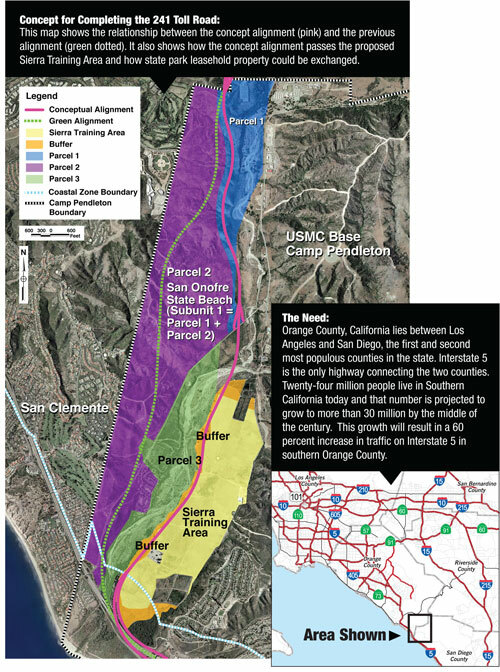 So raise your hand if you know Trestles and you don’t think a highway interchange just south of Cristianitos will impact our beloved surf spot. If you look at this new alignment from the Transportation Corridors Agency (TCA), which at least avoids going down the spine of the San Mateo Creek portion of the state park, you can see that the interchange is only moved yards southeast of the originally planned alignment (the green dashed line). And, now instead of the state park, the alignment impinges on the Marines’ training area. For decades, we have seen that the only thing that keeps San Diego and LA from merging into one city is Camp Pendleton. If you keep chipping away at its boundaries, eventually you won’t be able to use this critical base for its intended purpose. And, the only open area break along the So Cal coast disappears. There has to be another answer. Yes, it will cost more, but if concrete automobile tracks are the only way to move people, then we will just have to pay more to build them. We can’t just keep using all our open space to build infrastructure just because it is less expensive. This doesn’t even go to the likely impacts to Trestles and the local ocean environment. If we can’t find a better answer, we will all end up paying the toll, for a long long time. This photo is a week old. 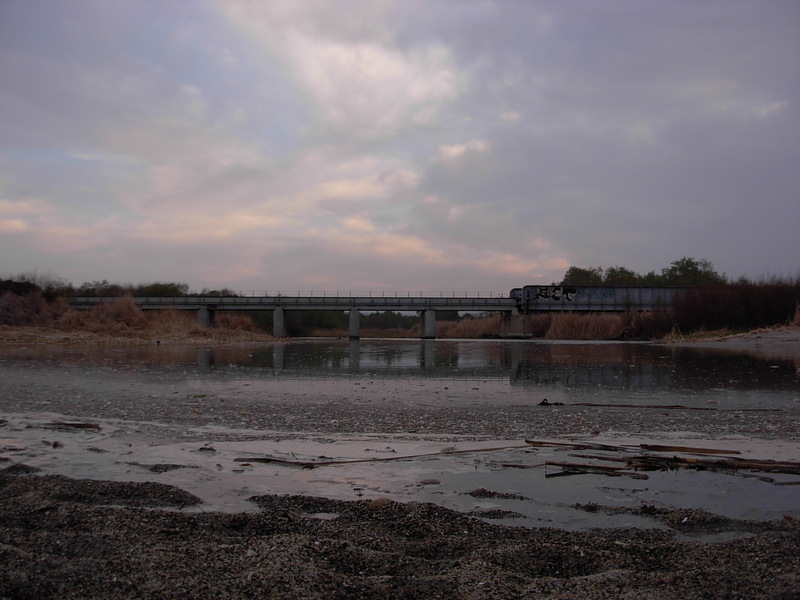 But, the point is that San Mateo Creek continues to flow naturally under the trestles and out to sea at Uppers. As of this photo, the creek had been flowing non-stop for about six weeks. Hopefully, the sand flow and bottom changes set us up for another epic summer for waves. In the photo, the embankment is about seven feet high. So, there has been some significant sand cutting. Just downstream, the creek cut an “oxbow” in the sand. What a sight to see, right here in Southern California. Being a water engineer, I’m used to gaging water flow just by looking at it. I’m guessing this flow was about 50 cubic feet per second. Not bad for an ephemeral creek. Time to break out the fly rods for those steelhead. 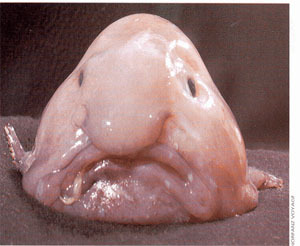 [Just kidding, our friends at Trout Unlimited and Center for Biological Diversity]. Anyway, I decided to go looking for beavers myself the other day when I had some time to kill. Unfortunately, I’m a lot bigger than a beaver so I never did quite make it all the way to the creek. By the way PETA, surfers respect animals, so no need to worry. Besides beaver meat doesn’t even taste good. I trudged through the weeds (er, native plants), being careful not to step on any newly emergent green friends (again, native plants). 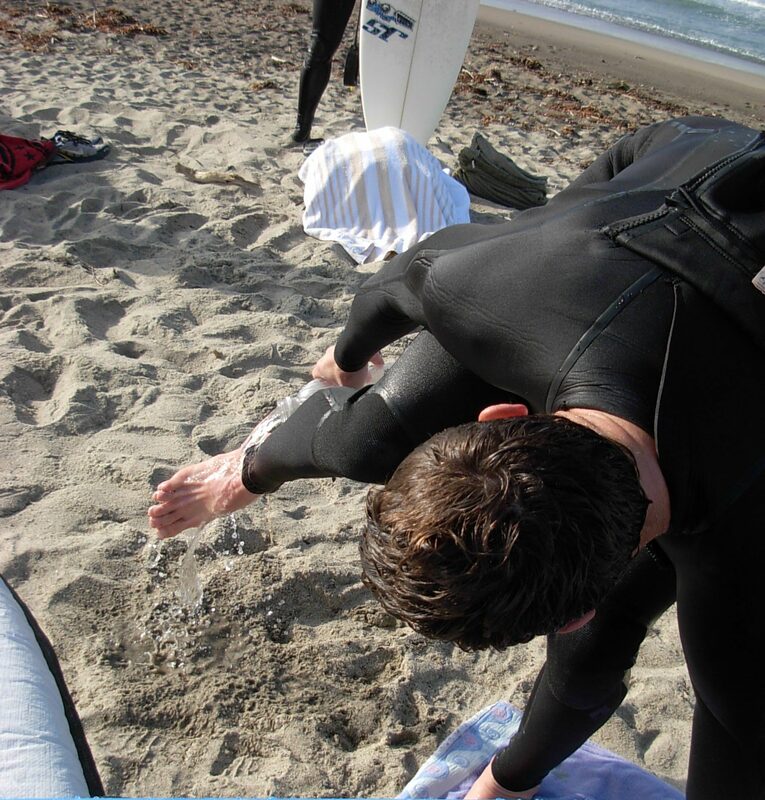 It’s takes a little longer when you’re carrying a board and towel and you’re wearing sandals. I found a couple homeless camps and abandoned underwear, but no sign of beavers, unless beavers started wearing boxers. The area in the floodplain is definitely prime area for beaver habitation. There are lots of willows, alders, and cottonwood; prime building materials for those furry little homebuilders. But, there were no signs of a beaver logging party. In other areas where I’ve seen beaver activities, there are sometimes acres of open area where all the trees have been felled by a beaver family. On this trip, the only felled trees I ran across are those beautiful eucalyptus taken out by the State Parks folks. The goodnews is that they have now planted a ton of native plants. Hopefully, the winter rains are loading them up to explode into greenery this spring. So, no new signs of beavers. 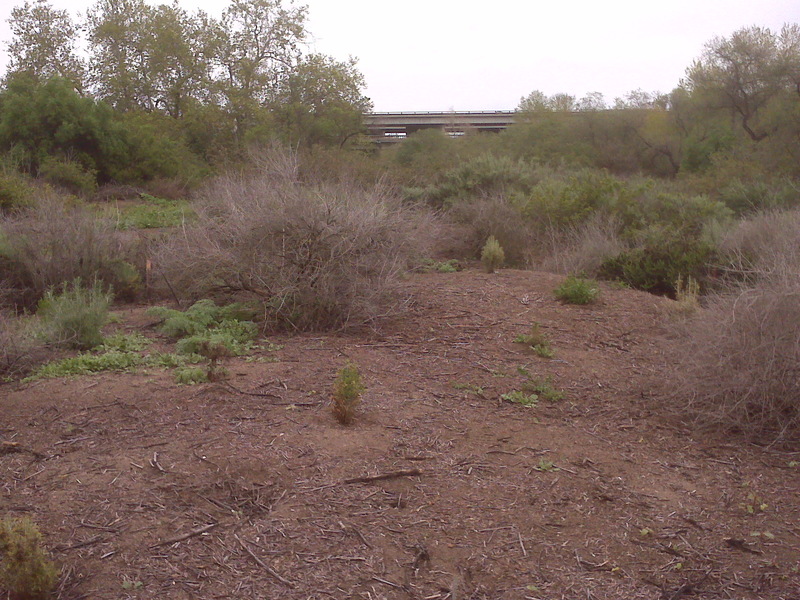 But, if you do ever see signs of the San Mateo Creek beavers, please forward some pic’s so we can share. In the meantime, look out for those dam beavers, I mean beaver dams.